Happy New Year chocolovers! Here’s to a successful and joyful 2013 for us all. 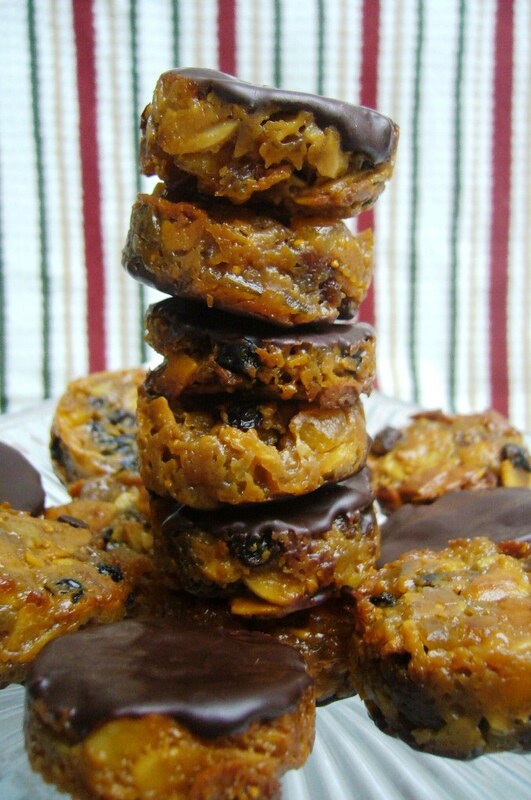 I love florentines, especially at this time of year. They get me into the festive winter spirit, with their dried fruits and nuts, sticky sweetness and warm colours. This year, I decided to make florentine mini-bites, or as I’ve newly named them, florentinies. These are chewy and a bit soft in the middle, filled with soft dried figs, stem ginger, currants, dried apricots, citrus peel, blackcurrants and toasted almonds. They’ve been given the finishing touch with a glossy spread of dark chocolate. Pre-heat oven to 180°C. Heat together butter, sugar and flour over a medium flame, stirring continuously. When all melted, add crème fraîche and stir well. Mix in all other ingredients. Spoon out into a silicone muffin tin for uniform pieces. Bake for 15 minutes until golden brown and bubbling, then transfer to a cooling rack. When cool, spread with melted, tempered chocolate and leave for a few minutes to set. Yum yum! Makes around 15 florentinies. Store for several days in an airtight container, or even better, invite some friends over to eat them up immediately!